Fighting Through the Fear-Mongering: What Is Genetic Engineering? There’s been a lot of talk lately in the news about genetic engineering (aka, genetic modification), about its promise and its pitfalls and everything in between, so it’s a concept we all better get pretty well comfortable with if we’re to get along in this “brave new world” we’re about to enter. First, we want to know what genetic engineering really is. Simply put, it’s the manipulation of an organism’s natural genome through the addition of snippets of DNA—the stuff of life itself. It means tampering with evolution to create something that was not forged over hundreds of generations, that does not come through the laborious trial-and-error of natural selection. It may be surprising to learn that genetic engineering has a very antique pedigree—and not all of it is a consequence of human activity. Spontaneous GMOs (genetically modified organisms) have been shown to arise naturally, through parasite- or pathogen-mediated gene exchange; lateral gene transfer, in which genetic information is swapped between organisms in a non-reproductive fashion, seems to have played an important role in the evolution of the eukaryotic lineage—in other words, of all the animals we loveth best, both great and small. And this likely happened well over a billion years ago. Of course, the most famous example of genetic engineering is that inadvertent and rather sloppy business of plant and animal domestication that began many tens of thousands of years ago, with the first wolf-things skulking around human settlements. This eventually gave rise to the Neolithic Revolution, with a whole host of unnatural plant species evolving through human tinkering to become the staples of civilization, and…well, we all know the outcome of that story. But as human knowledge has increased, so has our power to influence the machinery of life—so far from merely breeding new crop strains, we can effect our own form of lateral gene transfer, by directly inserting foreign genomic elements into organisms that never rightly evolved them in the first place. These GMOs or transgenic organisms are usually modified in some specific way—typically crop strains with beefed-up resistance to insects, herbicides and pesticides, or some other desirable trait. Occasionally, and more controversially, transgenic animals are created; one has only to think of the recent proposed experimental release in the Florida Keys of transgenic, self-limiting male Aedes aegypti mosquitoes, which carry genes that kill any offspring they may have with females in the wild. The idea, of course, is to eliminate the infamous Zika vector—a noble and worthwhile goal, certainly, but some have expressed concerns along the lines of “the road to hell is paved with good intentions” sort. In any case, once you’re at the level of creating reproductively disabled organisms, you’re really cooking—no breeding program, no matter how sophisticated, could likely ever produce such an unnatural chimera, for obvious reasons. To do so requires the direct manipulation of DNA itself—those helical ladders of nucleic acids that encode the quaternary computer software of life (represented as A, C, G, and T). The combinations of these four letters code for genes, which in turn produce proteins, make up the architecture and machinery of life. And that’s where things get really interesting. The DNA software of life is all written in the same coding language, whether one is dealing with the lowliest bacterium or the loftiest…well, let’s not say human being, because that’s an unforgivably speciesist attitude to take (but you get what I mean). 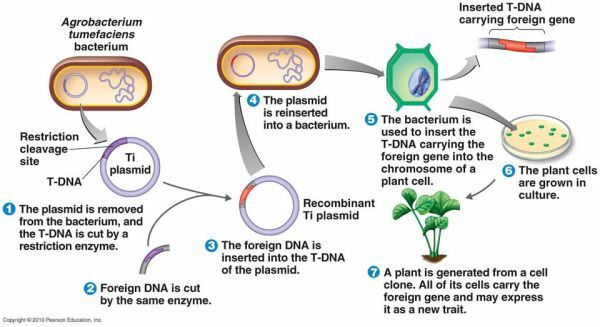 Illustration of the genetic modification method using the Agrobacterium tumefaciens species to insert transgenes into plant cells. Credit: Pearson Publishing, Inc.
All genes are interchangeable; if you can snip a gene from one organism’s genome and insert it into another’s, it will function in exactly the same way it did in the original organism. One has only to use recombinant, or chimerical, DNA—that is, DNA spliced together from different organisms—to create this “transgene,” and find a way to slip it into the target genome. Some techniques use gene-tampering bacteria to insert the transgenes; Agrobacterium tumefaciens, for instance, is well known from its use in the agricultural industry to manipulate the genomes of unsuspecting plant species. But this is still a tedious process that requires much trial-and-error; newer “gene editing” methods are much more precise, such as the CRISPR Cas-9 system that has done such wonders for genetic engineering. The technology of genetic engineering is advancing rapidly—each year, it seems, brings with it a wondrous new enlargement of our powers in this direction. Whether solutions to the legal and ethical implications of this technology appear as rapidly, however, remains to be seen.